It was frighteningly quiet around Blood Red Shoes in the past years. At the end of the last tour the strings that attached this duo were nearly passed breaking point. All sort of other personal mishaps got on top of these unhappy times as well. 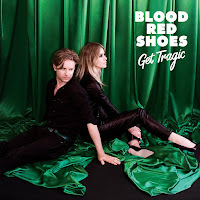 Get Tragic is a logical title of Blood Red Shoes' fifth album and I am glad to write that there is a fifth album. Being a fan from the first album onward, with 'In Time To Voices', the third album, as absolute favourite, a new album is always something to look out for. Laura-May Carter and Steven Ansell have managed to come up with a new album and it is fortunate they did so. Yes, it is more laidback in places compared to previous albums, but there is so much to enjoy on Get Tragic. Even songs that could be the soundtrack of the new James Bond movie and for the one after that. The only thing needs doing is work the title into the lyrics. The music is more than just a duo setting. There are keyboards and (digital) percussive stuff. 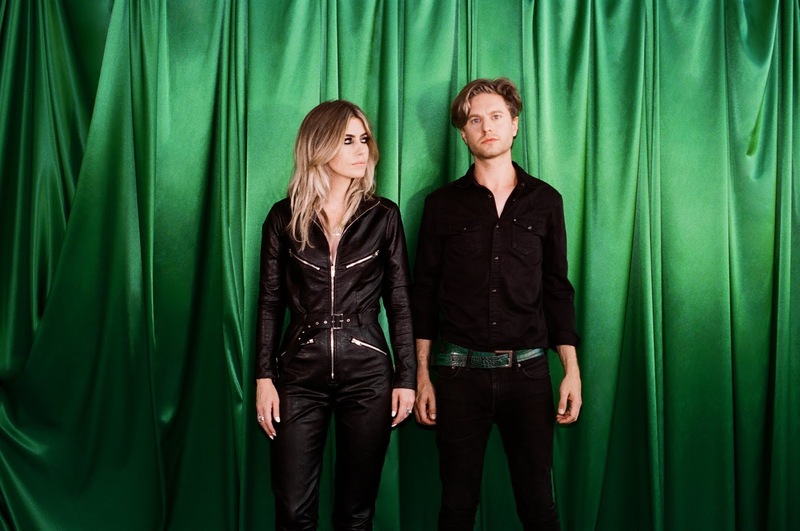 Being, at heart, a guitar - drums duo, Blood Red Shoes has always been more. The songs are divided between the two. Vocal duties are shared, besides the harmonies, making all albums varied. Get Tragic is no different. For me this works extremely well, as both Carter and Ansell have pleasant voices to listen to. It makes one + one = two and a half at a minimum and often three. Compared to previous albums Blood Red Shoes has worked in a lot more electronics than before. Impossible to play as a duo. So I'm curious how the new songs will be played live. A backing track?, bare?, or with a keyboard player/guitarist? Not everyone is a Jack White, running from instrument to instrument on stage and making noise for ten. 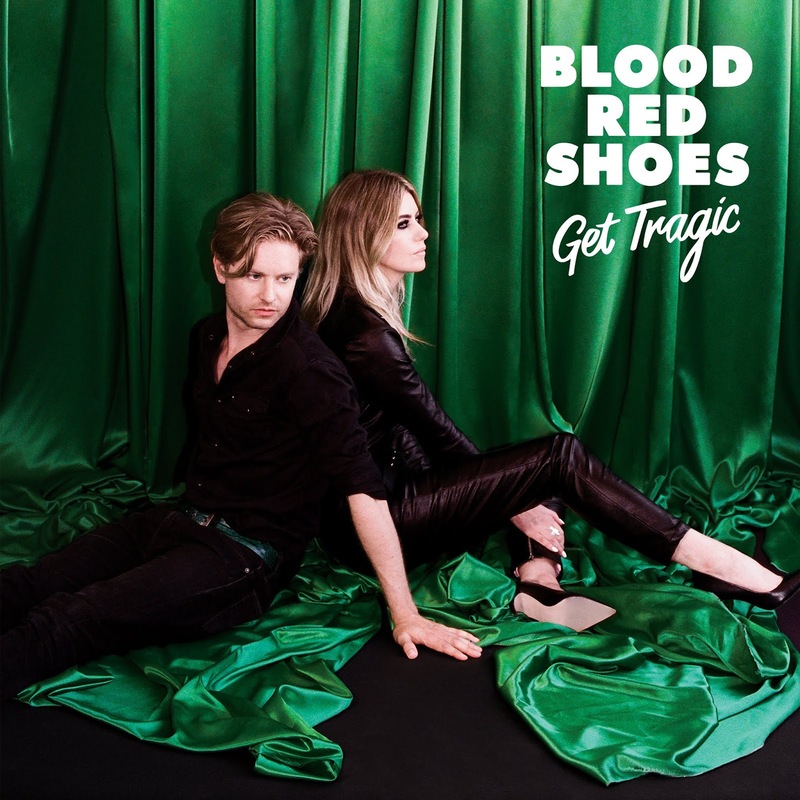 As I started the review, Blood Red Shoes had a hard time finishing this album. Writing sessions started already in 2015, but took some time to finish. In the meantime they worked on their own label, Jazz Life. Members of one of the signees, Tigercub, play on Get Tragic, so indeed a change to approach. The opening song could well be a hint at the past, troubled experiences, 'Eye To Eye', in the sense of not seeing. Well, unhappy artists seem to write good to great songs. There are several to be found on Get Tragic. To start with 'Mexican Dress'. A propulsive rhythm drives on this song, with Laura-May Carter at her absolute best as singer. The rhythm changes and dynamics do the rest. 'Mexican Dress' is the kind of song that makes me simply love Blood Red Shoes. 'Bangsar' has this delicious build up, working towards a great chorus, while 'Nearer' has these James Bond elements within it. Tucking into the album by the song, the variation shines through. It makes Get Tragic a lot less direct, but gives it an extra layer. A layer of surprise and one of depth. There's simply more to discover and enjoy. That said there is no song that comes close to my absolute favourite Blood Red Shoes song '7 Years' with that fantastic ending. I played that song so many times in 2012. I'm not complaining though. Get Tragic is a fine album and I'm glad to have the band back and in fine, musical shape.